Blue looking like Pac in the tub. Recently, Noreaga and Memphis Bleek announced on their Drink Champs podcast that they had successfully orchestrated a squashing of beef between Jay Z and Fat Joe, a feud that stems back to the early days of Terror Squad and Roc-A-Fella respectively. 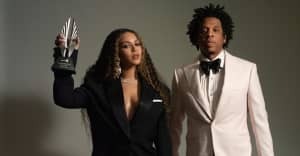 After the two reunited at Beyoncé's Formation tour, Fat Joe and Remy Ma released the official remix for their hit "All The Way Up" featuring Jay Z, who appears for his first verse in over a year. Hov makes mention of Beyoncé Lemonade album - paying homage to Guru in the process - and also gives a nod to Prince. Naturally, the internet is currently going crazy. @S_C_ @plainpat @fatjoe @FrencHMonTanA all the way up! https://t.co/Pj79jeTYxG the wild needs this. JayZ on All The Way Up Rmx = Beyoncé on Flawless Rmx. People hype off them saying absolutely nothing.